I have painted so many wonderful things for folks on their slate frames...but this last one, was so much fun! A customer had purchased one of my mini slate frames, ( I have two currently available in the ETSY shop) at Williamsburg last year, and this year she brought it back and asked me to paint it with 'creepy crawlies'. 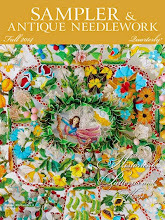 There are microscopic little ants traveling in and out of the peg holes....butterflies, may flies, caterpillars...a snail, various little bugs, all inspired by 17th c embroideries. The yellow bug above is my favorite of them all, inspired by a bug on the bottom of a mirror in the Burrell collection. I love monochromatic painting~ blackwork is my favorite, but was thinking of maybe painting something up in indigo....it is a true challenge to see how much depth and detail I can achieve just using one color of paint. I thought it would be fun to share with ya'll how the top of this box progressed, from being quite flat and lifeless, to looking pretty awesome. The design is first drawn on with India ink and a quill pen. Some parts I dont ink in first, like the building above, because I wanted it to be further off in the background, and not such a focal point. So it got painted first...just a hint of a building, not too many details. I left the pictures large so you can really see the details~ he is coming along. I love how the woodgrain shows thru the watercolours on these pieces. After gentleman was mostly finished, I start on the border. Watercolours are so fragile before they are varnished, they cannot be touched, or the paint will literally just wipe off. When painting a large piece such as this one, I must start in the center, and work my way out, so that I don't accidentally place the heel of my hand or my pinky finger on the surface, and take the paint off. I love how he came out, and can't wait to see it after Sharon finishes the inside. The ends, when closed, make a complete design. I do love to paint. Come see me in Bath! All Original folk art, pictures & written content herein are subject to copyright and may not be reproduced in any form. Thankyou!